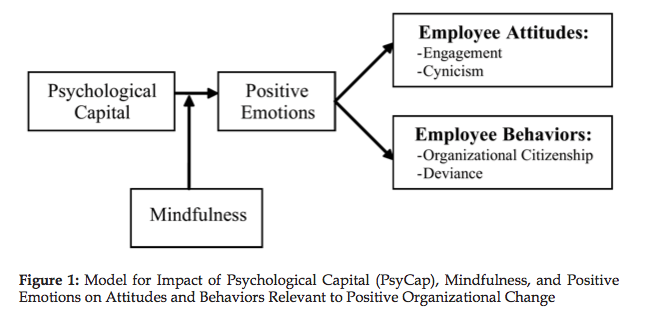 Mindfulness may protect CEOs/leaders and entrepreneurs against anxiety, depression, and the negative effects of burnout (i.e., emotional exhaustion and cynicism). In a recent study examining hundreds of CEOs, leaders, top and junior managers, and entrepreneurs in this month’s issue in the Journal of Occupational Health Psychology, researchers found that those who practiced high levels of mindfulness were less likely to have anxiety, depression, and burnout (Roche, Haar, et al. 2014). These results are consistent with several studies over the past decade showing how mindfulness improves one’s sense of well-being and reduces psychological symptoms and emotional reactivity. The study is also in line with previous research on mindfulness and employees, showing the positive impact of mindfulness in organizations. (4) when beset by problems and adversity, sustaining and bouncing back and even beyond (resilience) to attain success. Mindfulness practice has been shown in particular to help in groups who have lower psychological capital– lending a capacity to tolerate stress and change even where optimism and hope may be lacking. Through enhanced attention to current experiences, one may become more aware of negative or pessimistic thought patterns, providing an opportunity to observe oneself from the outside.